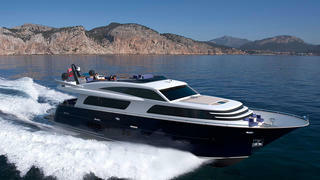 A third model in the Continental Three series is on the way after Dutch yard Wim van der Valk revealed that it had taken an order for another semi-custom yacht. The 26 metre superyacht will be hull number three in the raised pilot house range, which began in 2014 with the launch of 27.21 metre yacht The Next Episode. Wim van der Valk’s latest order will feature a classic, elegant interior with graceful lines and a strong emphasis on teak. The client’s requirements and preferred cruising grounds have informed the design of the low-profile radar arch, resulting in an air draft of less than six metres. Other semi-custom elements include the extended bathing platform, which can be hydraulically lowered into the water to launch the tender. The layout includes a main deck master cabin as well as three guest cabins on the lower deck, each with their own en-suite facilities. 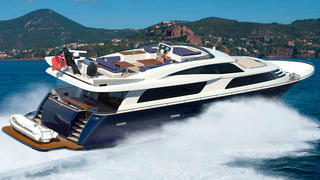 A variety of outdoor relaxation areas will suit al fresco entertaining, including the vast flybridge, which stretches back over the shaded cockpit. 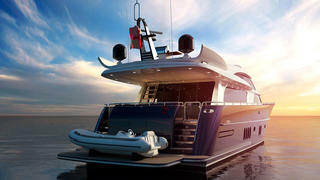 Power comes from a pair of 1,502hp MTU engines resulting in a top speed of 25 knots and a cruising speed of 20 knots. Other key equipment on the Continental Three includes a Naiad 302 fin stabilisation system, a pair of 26kw Northern Lights generators and a 45hp bow thruster. Founded in 1968, Wim van der Valk is based in the Dutch city of Waalwijk and its range includes the 36.8 metre Continental Four steel displacement yacht Santa Maria T.